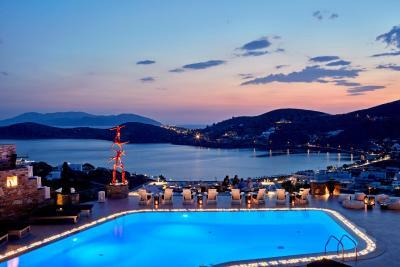 Lock in a great price for Liostasi Hotel & Suites – rated 9.6 by recent guests! Everything was amazing from the moment we got off the ferry to when we left. Liostasi redefines luxury. Everything! One of the best staffed hotel I have ever stayed in! Everything. This is the place to stay period. Now, if you don’t want to spend 100 euros a nite in a luxury hotel with a killer view, pool, etc. stay @ a Pension down @ the harbor for 28-40. Overall amazing! The property and amenities were beautiful. The staff were GREAT! The breakfast was spectacular and the people on Ios were very kind!! Awesome 5 stars in Ios ! Everything was perfect from AtoZ. Location / View / Staff / Food was perfect. Would go back anytime. The Staff here are absolutely amazing! Super friendly and accommodating for all of your needs. I hurt my ankle while hiking and the staff there helped me get to my hotel room, provided buckets of ice for me and checked up on me everyday to make sure i was OK. I can't recommend this magnificent place enough! Lives up fully to expectation the wonderful facilities of the hotel and staff are of exceptional value hence 10 rating. You are made to feel very welcome and special by all. The food is excellent value and everything I had of the highest level. The cocktail menu was innovative and both looked and tasted wonderful! The pool area is of highest relaxation space and immaculate. Warmest congratulations to the manager and staff in achieving such a place on Ios which was the best in the whole of my Greek Island vacations now and in the past. A return a certainty. Liostasi Hotel & Suites This rating is a reflection of how the property compares to the industry standard when it comes to price, facilities and services available. It's based on a self-evaluation by the property. Use this rating to help choose your stay! 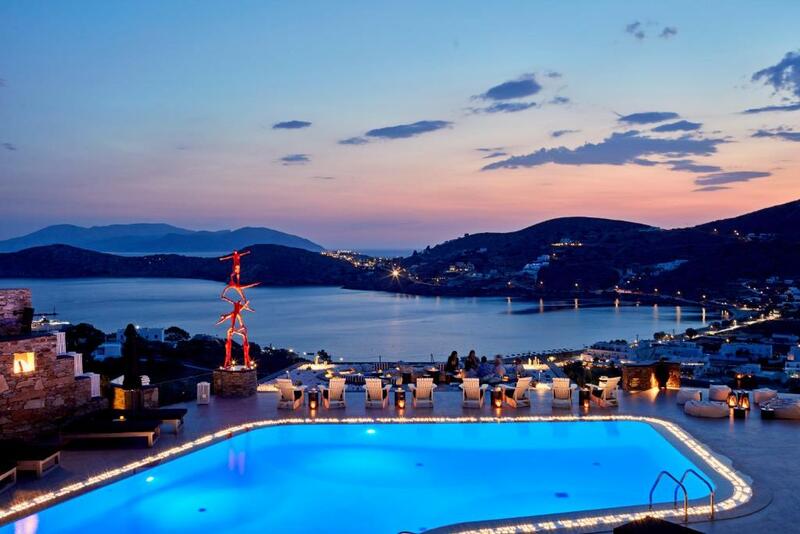 Offering a pool and a spa center, the stylish Liostasi Hotel & Suites features elegant accommodations overlooking the Aegean Sea. The nearest beach as well as the picturesque village of Ios, Chora are accessible within proximity. Elegantly decorated, all rooms and suites at Liostasi open to a private balcony or patio. Each has a satellite TV and a mini fridge. Free toiletries are included. Guests may relax at the sun loungers, found by the pool while watching the sea view. Using natural products, several spa therapies are offered at the on-site wellness center. Free shuttle services from and to the island's port are provided. Free Wi-Fi is available in all areas. Greek Breakfast is daily served, including homemade bread, pies and various cheese types. Located in an open-air veranda, Grandma’s Restaurant serves selected Mediterranean dishes, while guests enjoy the sea view. A variety of snacks and cocktails are prepared at Liostasi Pool & Cocktail Bar. The Archaeological Museum of Ios is 0.6 mi away. The island's port is approximately 1.2 mi away while Milopotas Beach is at a distance of 1.6 mi. When would you like to stay at Liostasi Hotel & Suites? 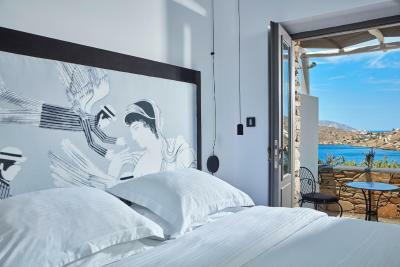 Featuring Aegean Sea views from its private, furnished balcony, this air-conditioned room is elegantly decorated. It comes with a flat-screen, satellite TV and a mini fridge. Free toiletries, bathrobes and slippers are included. Free Wi-Fi is available. 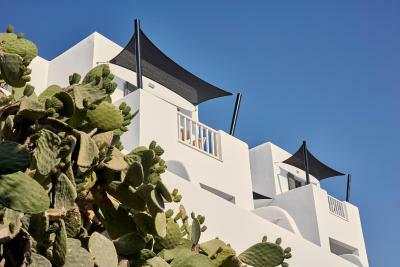 Featuring Aegean Sea views, this air-conditioned and elegantly decorated junior suite opens to a private patio with sun loungers. It comes with a seating area and a satellite TV. Bathrobes, slippers and free toiletries are included. Free Wi-Fi is available. 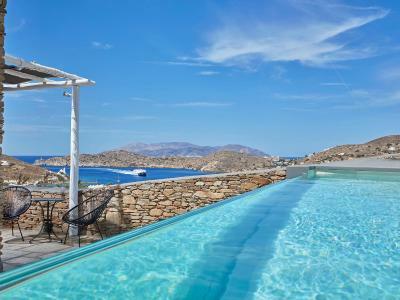 Featuring Aegean Sea views from its private, furnished patio, this air-conditioned suite is elegantly decorated. It comes with an open-plan or separate seating area with flat-screen, satellite TV and a mini fridge. 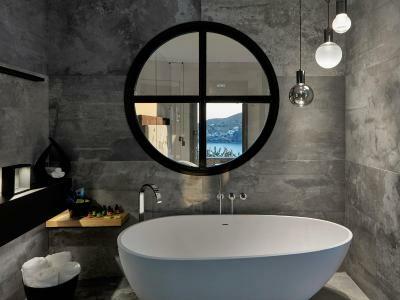 A spa bath or a shower cabin is included in the bathroom. Free Wi-Fi is available. This suite is featuring a bedroom with a double bed in a loft and living room in open-plan style. Includes bathroom with modern shower cabin and WC. Offers a spacious, outdoor private lounge with comfortable lounge chairs, sunbeds and dining area. A 32'' flat-screen TV in the bedroom and a 42'' in the living room are also provided. The suite has partial sea views. This suite is featuring a bedroom with a double bed in a loft and living room in open plan-style. Includes bathroom with modern shower cabin and WC. The spacious outdoor private lounge has comfortable lounge chairs, sunbeds and dining area. A 32'' flat-screen TV in the bedroom and a 42'' in the living room are also provided. The suite has sea views. This suite features two floors with a bedroom on the first floor and bathroom with modern bathtub with separate WC, living room in open-plan style on the ground floor. It offers a spacious outdoor private lounge, lounge chairs, sunbeds and dining area. It has sea views. A 32'' flat-screen TV in the bedroom and a 42'' in the living room are also provided. This suite has a private pool, tile/marble floor and private entrance. 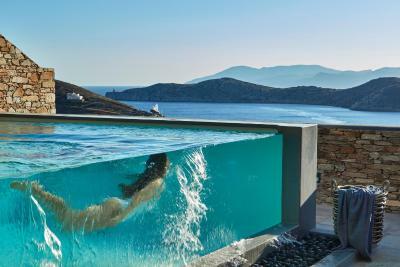 Liostasi Hotel & Suites is the only hotel-member of Small Luxury Hotels of the World in Ios Island. Situated ideally between the port and the historical city of Ios, Liostasi Hotel & Suites has been characterized as an exceptional boutique hotel providing a romantic atmosphere, high quality in services t but most of all a breath taking view of Ios sunset. The beautiful beaches and the popular night life of the island are a few minutes away from the hotel . House Rules Liostasi Hotel & Suites takes special requests – add in the next step! Liostasi Hotel &amp; Suites accepts these cards and reserves the right to temporarily hold an amount prior to arrival. Liostasi Hotel & Suites accepts these cards and reserves the right to temporarily hold an amount prior to arrival. Please note that free shuttle services from and to Ios Port are provided. Liostasi Ios Hotel & Spa participates in the Greek Breakfast Initiative by the Hellenic Chamber of Hotels. The food and cocktails were amazing. Our room had the most beautiful view! We loved everything, nothing negative to say about our stay here. Absolutely everything. The staff were incredible, couldn’t do enough for us. The views and the facilities were amazing, the restaurant was great and the spa treatments were some of the best we’ve had. Such good value for money. all the staff were exceptional, super friendly and attentive. divine breakfast. the inhabitants of IOS are fantastic people and Ios is very beautiful. The menu could have more vegan options. The few options were delicious though. Also, we were disappointed about the cinema being always cancelled (even on nights with barely any wind). The terrace overlooking the port is the highlight of Liostasi. Since October can be quite cold, the staff always brought us blankets to watch the sunset. There’s also a dj and the music is very good! The location is perfect and we appreciated being picked up from and driven to the port. breakfast buffet magnificent... staff unbelievable .. Afraid for us Grandmas was a big disappointment,food for us did not meet all the hype,especially as staff at hotel really do sell dinning at grandma's. Very good service but afraid food just not at a 5 star level. The location is stunning, the transfers very nice and organised, staff are great and look after guests; the breakfast is realy tasty and an easy walk to town and port. All day music around main pool area. More than just cool background music. Simply disturbing as too loud. Choice of music was fine however. Guests taller than 1.80m might have an issue in some of the suites (#51,52) as ceiling in bedroom on mezzanine level is quite low. The location, the transfers, the friendly staff, the comfy bed, the facilities, the attention to detail, the breakfast, the view. Everything, from the guy at the transfer shuttle by the port to the lady at the reception, from the pool area to the suite, ending with a fabulous dinner at grandma's!!! We went for our honeymoon, The pool area was available to use for non residents. The 3 days we were there we felt out of place a lot of noise people coming to eat in the restaurant had access to the pool this was not pleasant at all. Staff were friendly but maybe a bit too professional and overly formal. The room was very spacious and good value for money, it was exceptionally clean and modern and one of the nicest hotels we have ever stayed in. The pool area was great and we enjoyed the atmosphere, although we found the pool a little too cold to swim in. The hotel is quite close to the main town, about a 5 min walk which was convenient. The hotel restaurant, Grandma’s serves really amazing food and we ate here a few times but it was quite pricey.